‘A Time to Buy’ ~ Watercolour, inks, and gouache; approx. 305 mm square. 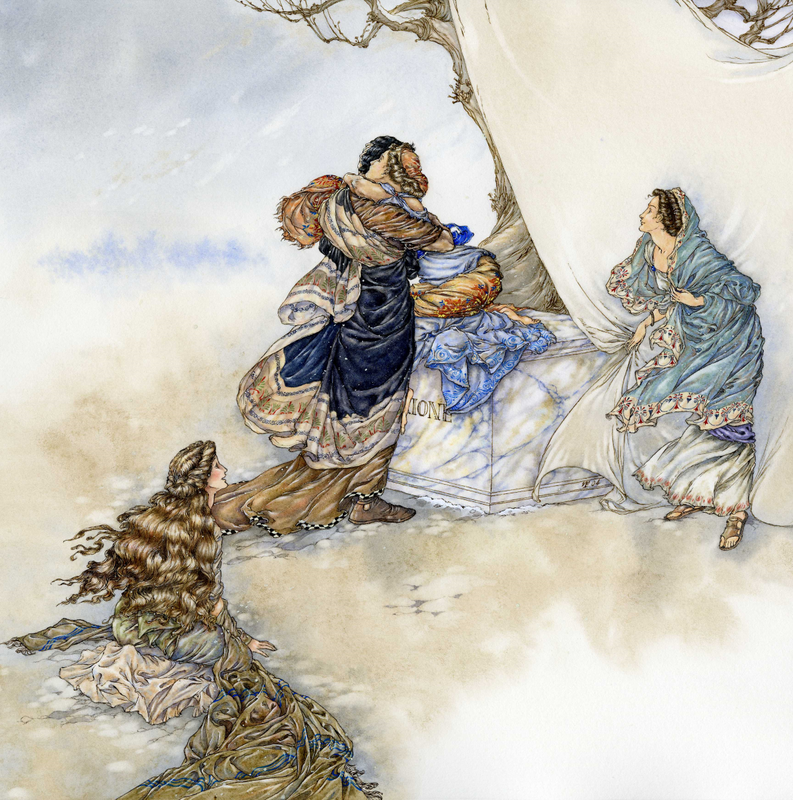 Illustration for the song, A Time to Buy, from Katie Melua‘s In Winter album. I enjoyed the gentle satire of this song and creating the illustration for it — though not so much all the straight lines and the geometry, which are not my forte and drive me slightly mad, as those who know me well are aware. 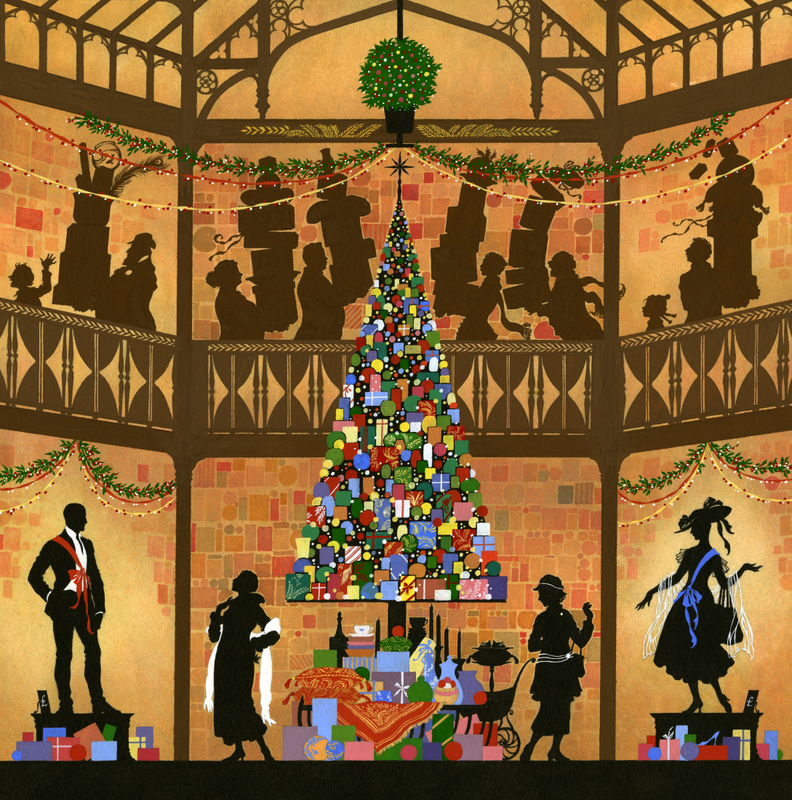 I suppose the process echoes the contradiction between the cheerful warmth and the commercially driven demands of the festive season, which I also tried to reflect in this piece. The department store here was of course based directly on Liberty of London. ‘River‘ ~ Watercolour, inks and gouache, 305 mm square. Oh, how I wish it. I don’t understand anything. 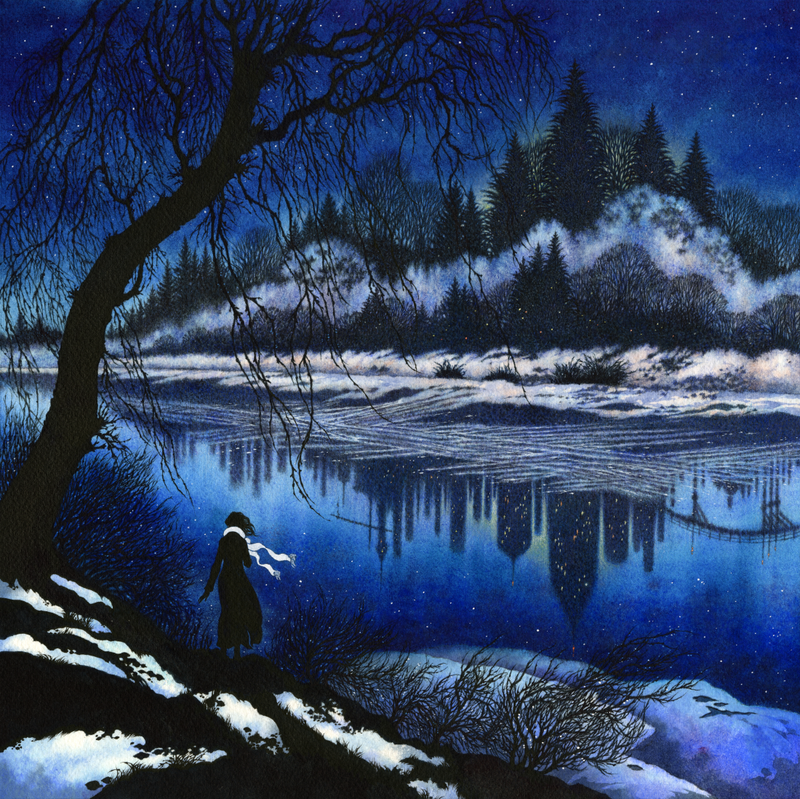 Illustration for the song, River, from Katie Melua‘s music album, In Winter, 2016. Incidentally, ‘Natee‘ means ‘river’ or a body of water. 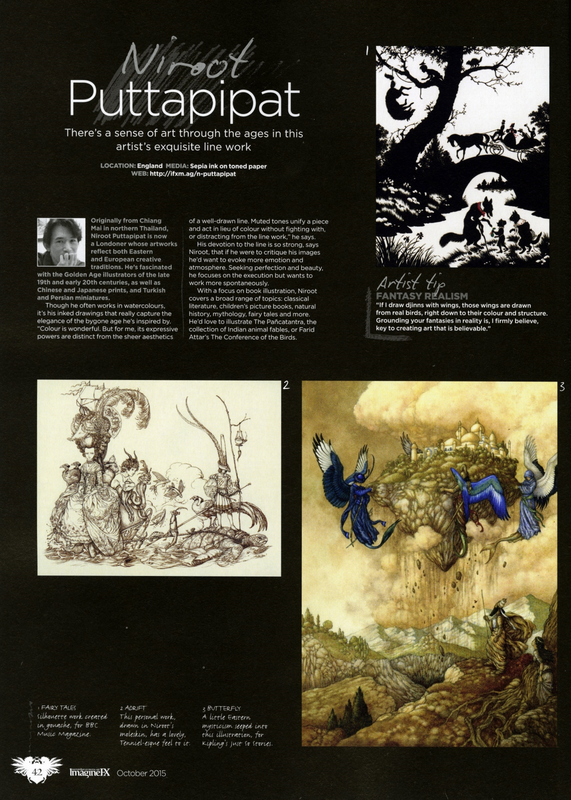 One of the reasons this piece is a personal favourite of mine of the album illustrations. 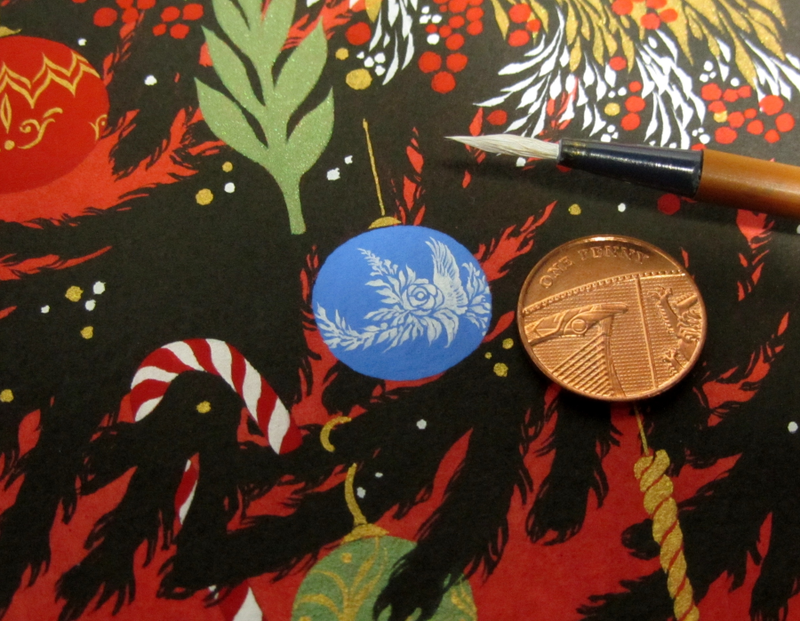 Last winter, whilst working on The Nutcracker, I shared this little detail on a few social media platforms and said how much I’d love such a blue jasperware bauble as the one I was painting. 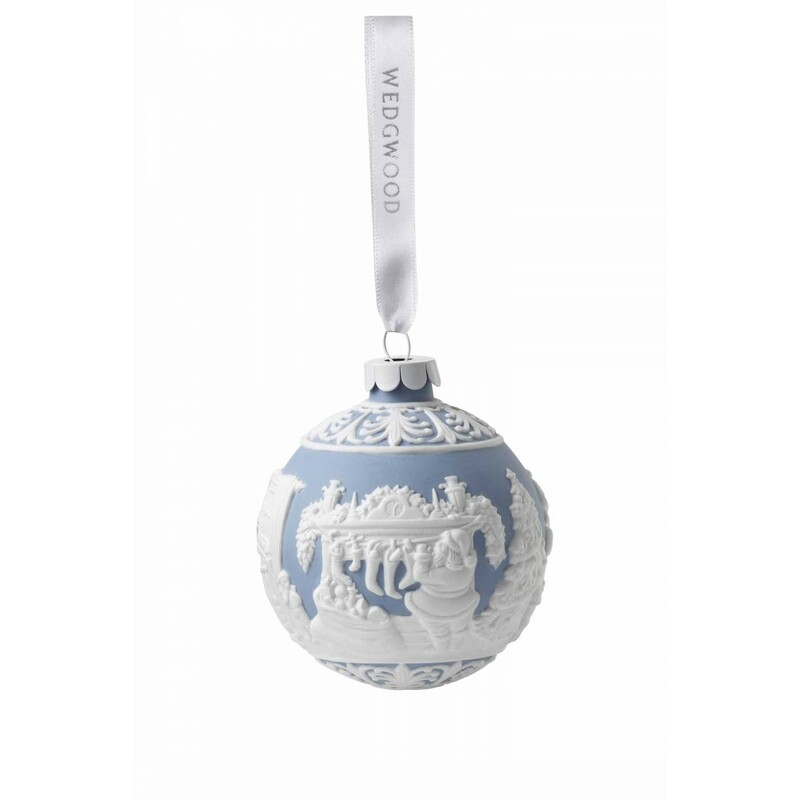 Today, I discovered that of course Wedgwood actually do produce such things. It seems perfectly obvious now, but for whatever reason, it didn’t occur to me then! Incidentally, Wedgwood blue is one of my favourite blues ever. 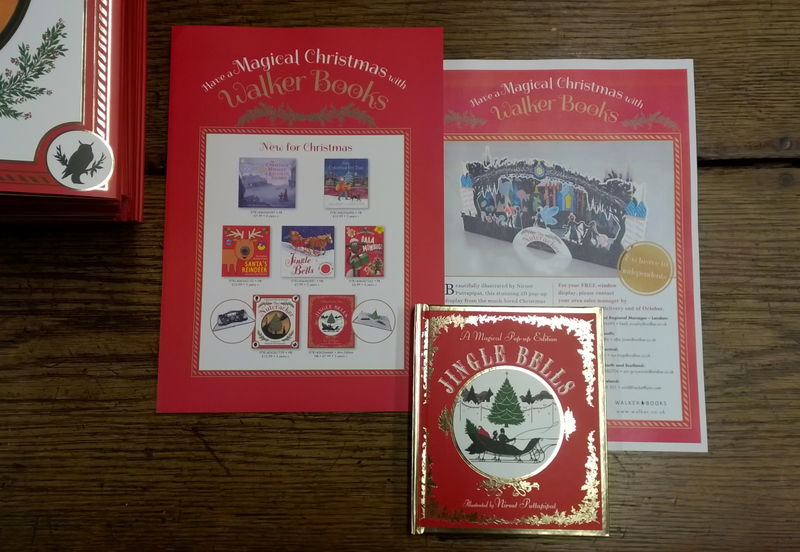 The original pop-up I made for The Night Before Christmas, published by Walker Books, 2007. White Canson Mi-Teintes paper. The base measures 472 x 236mm when open. The pop-up is roughly 155mm tall at its highest point (the church steeple). 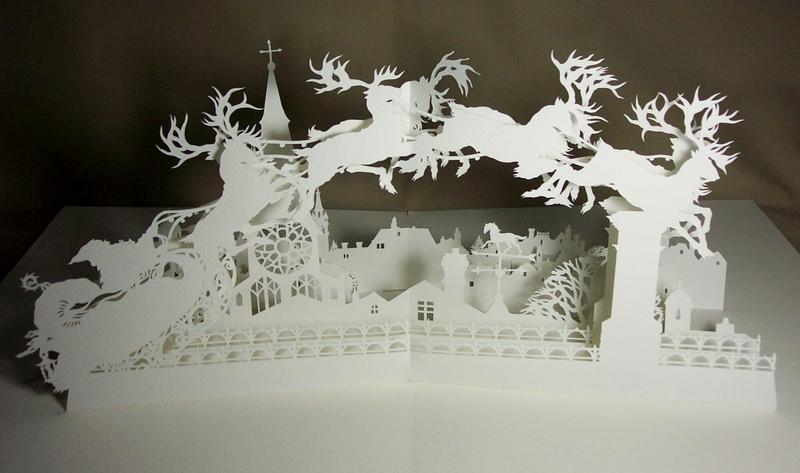 All the pieces were hand-cut with a scalpel. For those already familiar with my illustrated version of Clement C. Moore’s famous poem, seeing another post about it trotted out again this year might be a deadly bore, but as I haven’t posted about it properly on this blog before and I’m conscious of having gained new readers, I may as well as not. 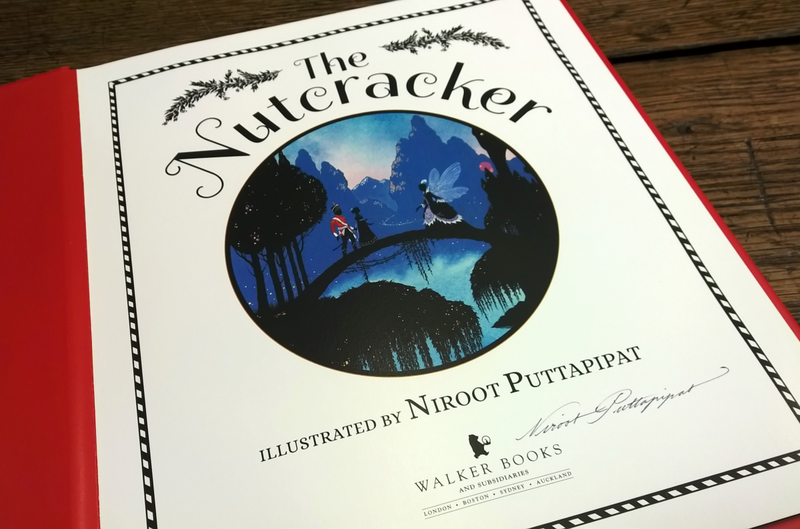 First published by Walker Books in 2007, the book was reprinted in 2012, and is now in its third edition in 2014: a mini one this time. 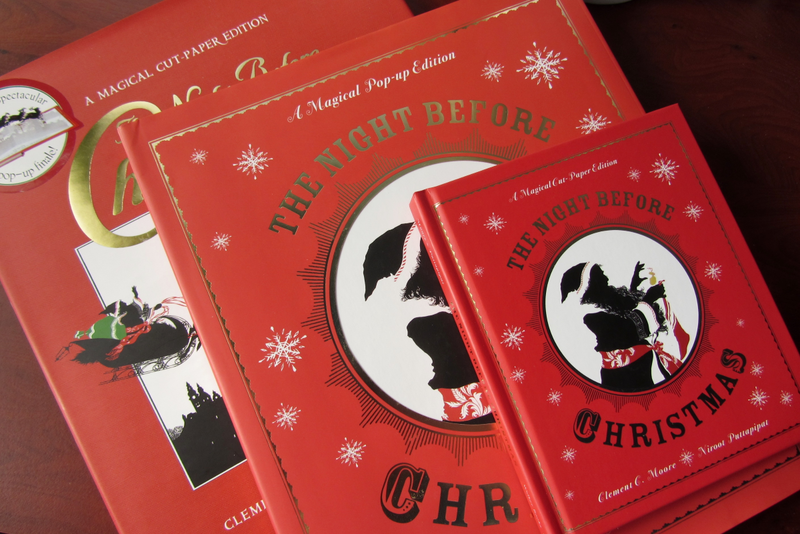 From left (bottommost): 1st edition, 2007; 2nd edition, 2012; 3rd edition (mini), 2014. This book has done great things for me. 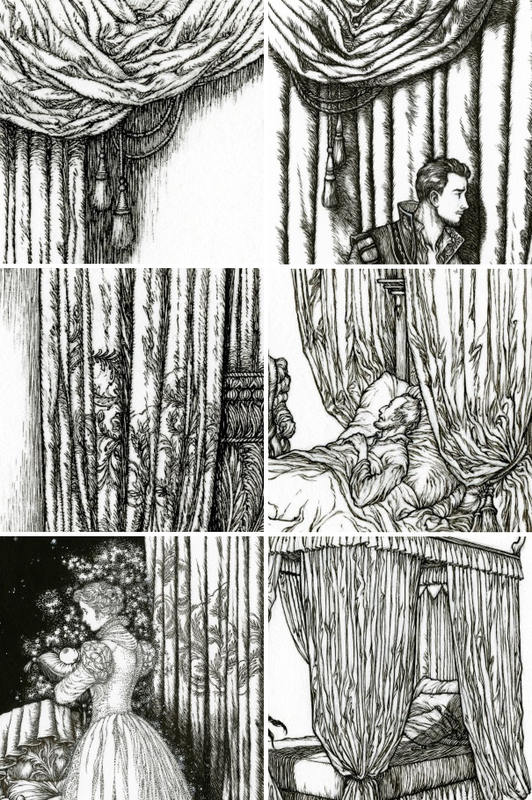 I have fond memories of working on it and can still look back at the illustrations without cringing (too much) on the whole. 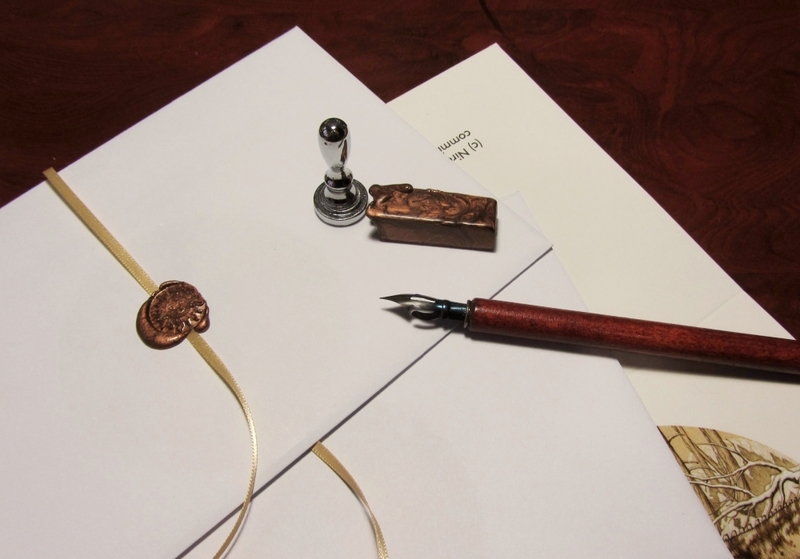 It has garnered favourable reviews and I’ve even received kind letters from readers. It was also the first book to have ever brought me royalties, which was and remains an ever so slightly mind-boggling thing for me. 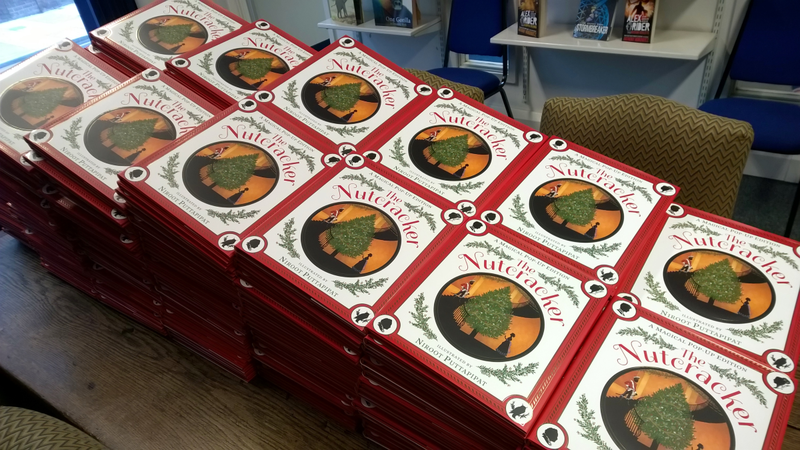 The latest I heard was that the present mini edition is selling like the proverbial hot cakes. It even made an appearance on Irish television’s The Late Late Toy Show. 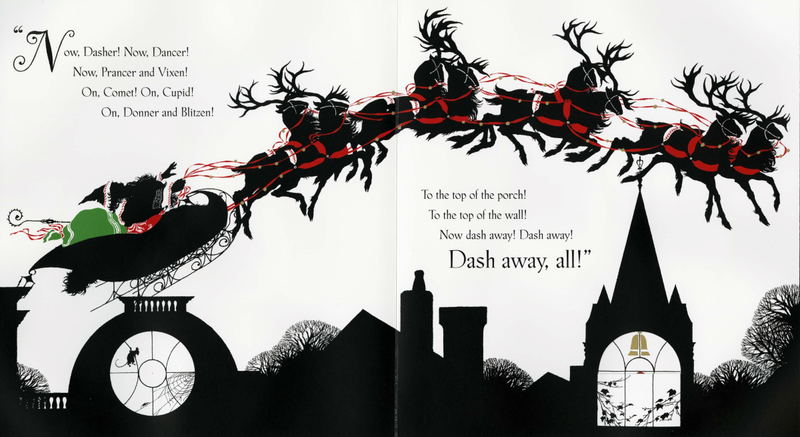 ‘Dash away, all!’ Spread from the book. I am fond of, and grateful for, this book. The pop-up I made for it will probably make an obligatory annual appearance for a little while yet. Here’s a bit of trivia for you: Each of the reindeer I drew has its own individual pair of antlers, and they were repeated accordingly throughout the book — including for the pop-up. The Coventry Carol. Ink, gouache, and acrylic gold on Arches cold pressed, 297 x 420mm. Christmas card, 2006. A slightly early seasonal Throwback Thursday. This was my Christmas card for 2006. 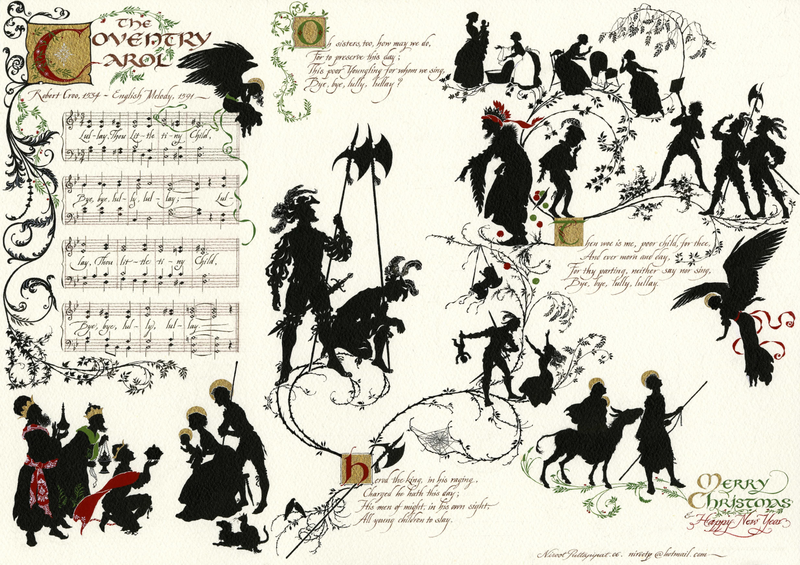 As with the Man and the Satyr card of 2005, it was reproduced on an A4 sheet of card which was then concertina-folded into thirds. Pencil, pen & ink, and watercolour on Arches cold pressed, 297 x 420mm Christmas card, 2005. 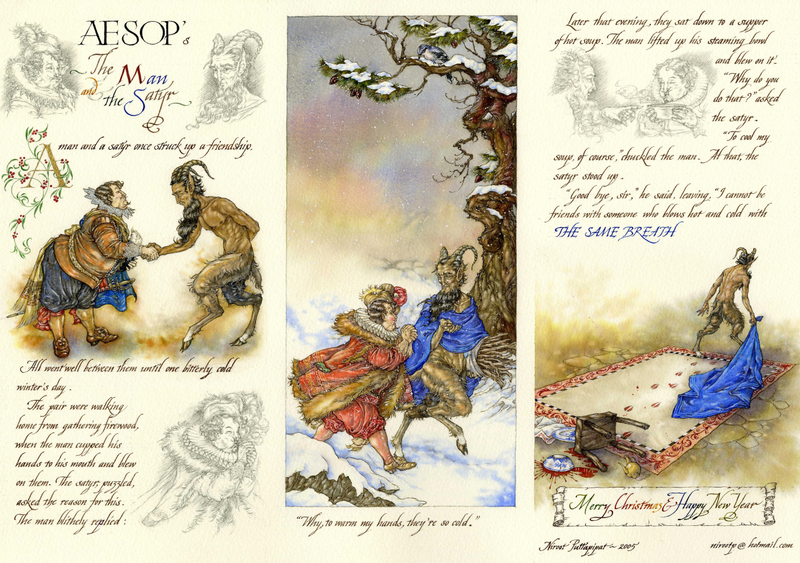 My Christmas card for 2005: Aesop’s The Man and the Satyr. 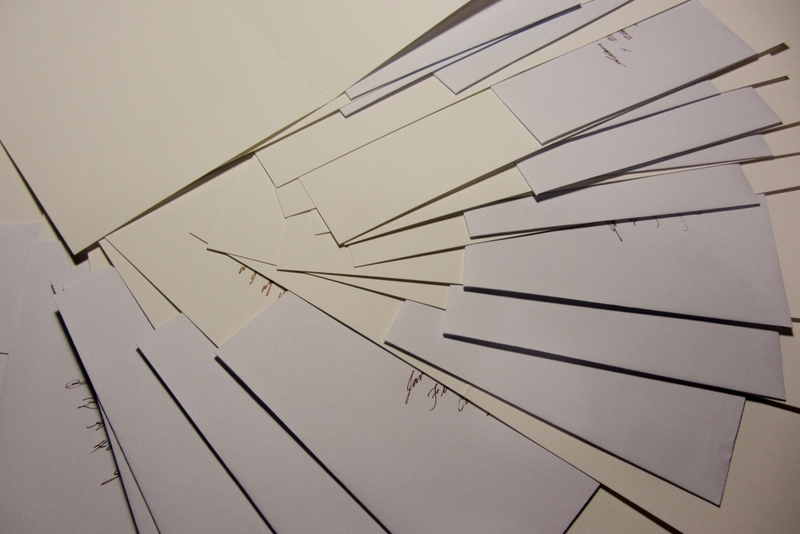 The piece was originally reproduced on an A4 sheet of card (210 x 297mm) and was then concertina-folded into thirds. 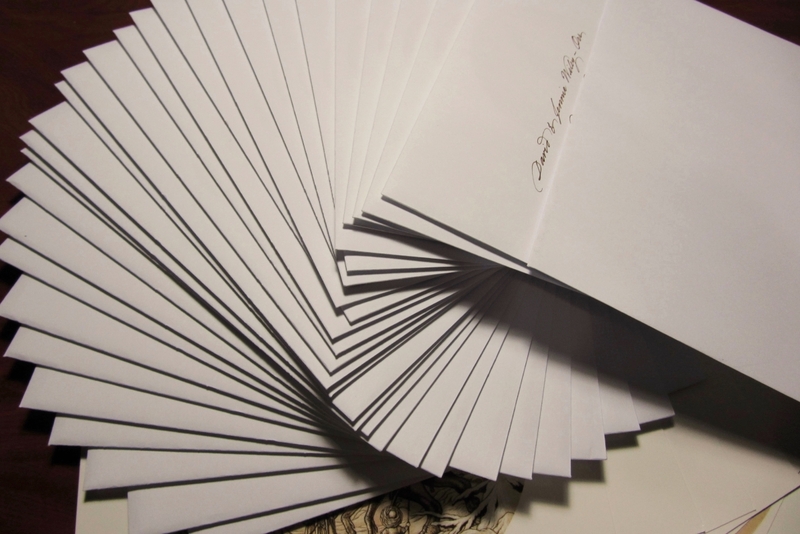 Unfortunately, it isn’t possible to send all cards this way, otherwise I would.